Audi is known as a progressive and innovative brand, internationally recognized as one of the best-selling luxury automakers in the world. Amongst the Chinese, there is a large opportunity for foreign brands with high status goods, due to the population’s rising wealth and increasingly Westernized lifestyle. It’s not as easy as simply translating ads, though – foreign companies need to communicate with perfect fluency and within appropriate social context to successfully sell to Chinese consumers. The Cowell Auto Group wanted to continue improving their ongoing marketing strategy and connect effectively with prospective buyers in the market for a new vehicle. With this in mind, they set out to increase brand awareness and sales, and they knew they had a huge audience in the Chinese demographic. To generate sales in the competitive automobile industry, they engaged with Sheng Li Digital to translate their brand to reach this target market. The focus of the campaign was to reach a Chinese target market online that was in the market to purchase a new luxury car. The primary goal was to generate interest online and encourage prospective car buyers to sign up for a test drive at the local Audi dealership. We designed and implemented a Chinese language landing page with a unique URL that was not accessible from the main website navigation. We wrote ad copy that encouraged prospective buyers to sign up for a test drive of Audi’s Q5 model and displayed promotional pricing and an interest rate that was very attractive. We also included copy that indicated that this was a time-sensitive, creating a sense of urgency, and encouraging visitors to act now. We used imagery and colors on the landing page that both complimented the Audi brand as well as appealed to Chinese luxury car buyers. Far beyond simple translation of the English advertising campaign, we formed a successful Chinese digital strategy using careful analysis and cultural understanding. Once the landing page was set-up and implemented live on the website, the goal was to drive as much qualified traffic as possible. We identified that search engine marketing (SEM) was a great way to reach Chinese people that were performing searches for automotive brands in Google. Sheng Li Digital set-up a Google AdWords campaign with search ads that enticed people with the promotional offer and contained a call-to-action that encouraged them to visit the landing page to learn more. We used geographic targeting and browser detection to display ads only to people that had Chinese language browser settings and that were in our geographic target market within 25 miles of the Audi dealership. We placed Google remarketing code on the landing page and set up a campaign to reach visitors that did not sign up for the test drive the first time, to come back and reconsider. We created image ads on the Google Display Network (GDN) in Chinese to retarget this audience. We also implemented Chinese online media buying campaigns during special events, such as Chinese New Year, that including advertising creative that messaging that appealed to the Chinese audience. Our research showed that events like Chinese New Year incite higher purchase rates than average, so we ramped up the Chinese media buying during this time to gain exposure for the campaign and to outshine the competition. 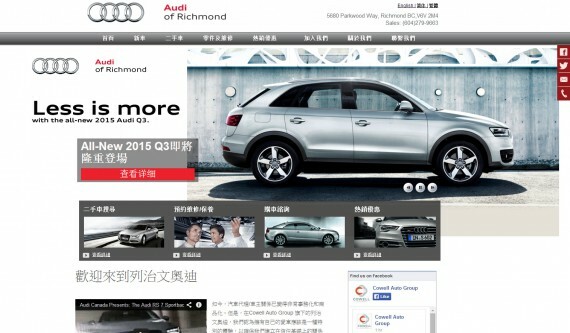 Audi became the top-of-mind car choice in the local Chinese community with Sheng Li’s help. The campaign achieved remarkable results. 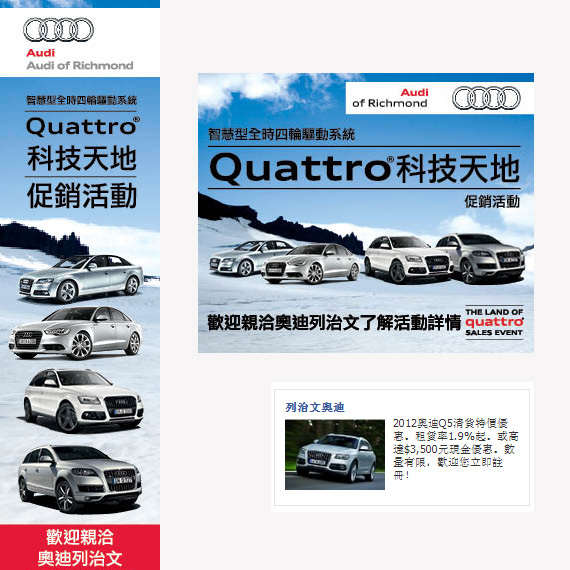 We showcased Audi’s message using the right tone and language to reach the Chinese market, positioning the client as a luxury brand and status symbol. Using Sheng Li Digital’s marketing services, The Cowell Auto Group was able to attract Chinese automobile buyers online – a strategy successful due to our fluency in Chinese consumer behavior and online shopping habits. Simply formulating ads wasn’t enough; understanding the preferences and mindset of the Chinese customer was the key to this campaign’s success.